You can generate all your timesheet data from the roster, this eliminates the need for your employees to clock on and off. 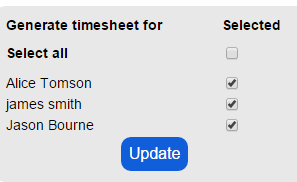 The below form allows you to select which employees you would like to generate the timesheet for. This gives you the ability to have some employees clocking their hours and others generating their timesheet data off the roster. Select the fiscal year and week that you want to generate the timesheet data for. Only the weeks that you have saved to the roster calendar will be available. 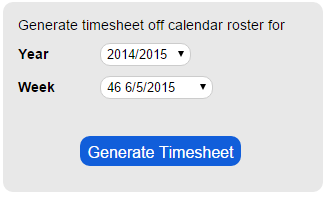 Click the Generate timesheet button. This will copy your roster data into timesheet data. The How column on the timesheet will illustrate that these entries were created from the roster.